I hope you all had a lovely Christmas. Mine was lovely, as soon as the day itself arrived, why, oh why do I set myself impossible targets? There were many VERY late nights in the run up as I'd decided that I wanted to make as many of my gifts as possible. There was also the small matter of an angel to dress! Now this is the third year that Anwen has been an Angel (she's also been a horse (?) and a star - thankfully the school sources their own costumes :-) . The first year (when she was three) I made a ramshackle dress without a pattern out of an old cream sheet. Last year I bought plenty of fabric to make her a new dress but when she tried on her old dress to see how much bigger I needed to go I decided that 'slightly snug' would do and that I'd save myself the bother. This year there was no doubt that a new dress was needed so a got out an old pattern (Burda - sorry I'm too lazy to go and find it for the name) that I'd previously used to make the bolero Anwen wore to our wedding went went looking for the fabric that I'd bought last year. And I looked, and looked, and looked. Despite having a good tidy up of my stash a few weeks ago I couldn't find the fabric anywhere! I could find a scrap of satiny fabric left over from making a bag to match my wedding dress, but I like an angel dress to be full length - not to the knee! There was nothing for it I would have to make the 60min round trip to my LQS which in reality would mean 2 hours lost sewing time by the time I'd gotten ready (what, you actually brush your hair even if your not leaving the house?) and factored in chatting time at the store. I decided to call in to the butchers in the village first and then popped into the charity shop opposite to see if they'd had any more vintage sheets in (they had!). Well would you believe it? They had the most disgusting shiny cream sheet! Now how someone could have slept on that was beyond me, but it had definitely been used as the nasty bobbling on one half of the sheet showed. 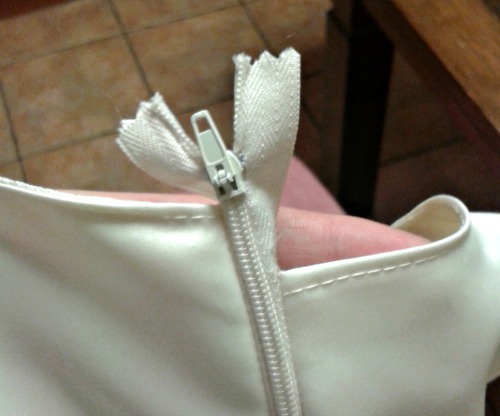 But the other half was pristine! Endaf was most surprised when I arrived home after only twenty minutes! ummmmm...Don't think it's supposed to look like that! Out came Mr Seamripper and with a little gentle persuasion we got a result. 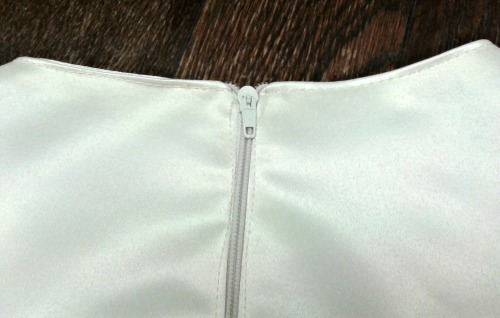 Well, as long as you don't look too closely at my top stitching! As soon as I'd hemmed it we had a little fashion show in the garden. Not too bad, even if I do say so myself! Now you see those wings? It's just a piece of cardboard spray painted gold and edged with some marabou - but can you imagine how big they looked on her two years ago? (She was three at the time!) Oh, and what do you think Endaf found in the bag with the wings in the attic? Only two meters of fabric, what else! Anyway, we enjoyed the performance immensely, and Marged even managed not drown the kids voices when she was shouting her sister's name! 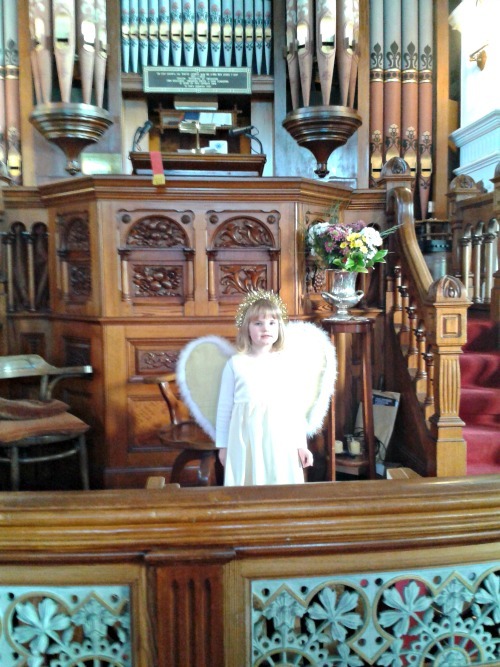 You did a great job on the angel costume Anwen looks lovely in it. LOL! I agree with Celtic Thistle, of course that is where the fabric would be. 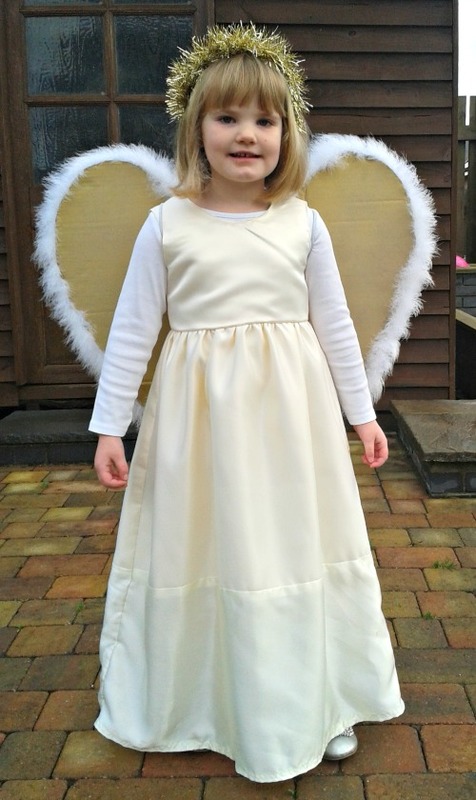 She makes a beautiful Angel, I can just picture how big they would be on a 3 year old.